Early this month, I wrote a Penguins preview that was essentially a giant cop-out. The city of Pittsburgh had a bad case of Bucco Fever, as Buctober threatened to halt any economic productivity for the city’s fans. With TBS only airing Pirates playoff games at noon on workdays, I exhausted a great deal of vacation time. By the time the Pirates season ended, I was worried whether I’ll have enough time off to go home for the holidays, I had thousands of emails in my inbox and—hey, look at that!—the Penguins were already 3-0-0! Pittsburgh sports fans are little like Miami fans, they really only have enough bandwidth to support one team at a time. In Miami, this is because fans are simply indifferent, and only care about whichever team happens to be winning. In Pittsburgh, this is because people invest all of their energy into one team and go a little crazy over it. Now that the Pirates are done until the spring and fans have had time to breath, it’s time to turn our attention back to the Boys of Winter. We all know about the star power the Pens have on offense. And it would be a waste of time if I “previewed” what Sidney Crosby and Evgeni Malkin can do this year. Hell, Crosby’s line with Chris Kunitz and Pascal Dupuis might even stay together on Team Canada (boo, Canada!). The two questions going into the season were defense and goaltending. The Penguins reaffirmed their trust in Marc-Andre Fleury—after he saw a psychologist, of course—and brought back Tomas Vokoun to help ease the load of a full season off Fleury’s shoulders. Then, Vokoun almost died. And now the Penguins have no legitimate back-up in net. Fleury has started 8 of the first nine games, going 7-1. 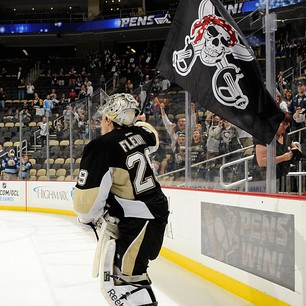 The one game they gave Fleury the night off, they lost 6-3 to the Panthers, in Jeff Zatkoff’s first NHL appearance. 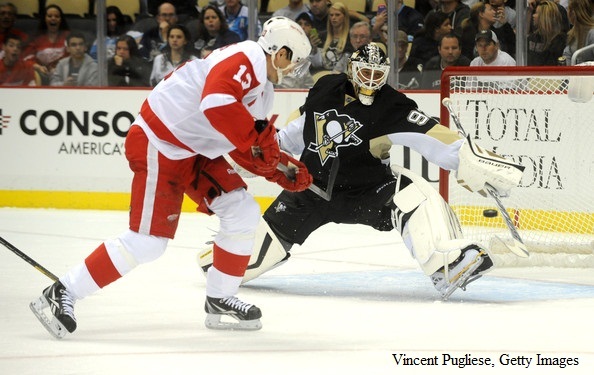 So while he may be off to a great start, Fleury looks like he may have to play in quite a few games this year. Luckily, he has a little more stability in front of him this season. Some credit Fleury’s newfound calmness in the crease to his therapist, but I choose to praise Rob Scuderi. The Penguins thought they could live without Scuds after they won the Stanley Cup in 2009. But since then, only Scuderi has won another Stanley Cup. He just brings a stability to the blue line that calms everyone around him. He’s already made some clutch blocks and saves this season. Kris Letang proved to be the Penguins’ best offensive defenseman last year (at least during the regular season), but an early season injury has kept him out of the lineup thus far. However, rookie Olli Maatta is quickly making a name for himself. He’s giving the coaching staff a difficult choice for when Letang returns to the blue line. But who am I kidding? Nobody is worried about the Penguins this year…during the regular season. We’ve seen it four years in a row. The Penguins stroll through the regular season—with the exception of 2010-11, where they injured themselves through the regular season—only to flop on the big stage. The Penguins regular season looks to be just like all the rest in recent memory. They should have no trouble finding a playoff spot, even if they don’t finish at the top of the standings. The only thing different this year is that the fans are getting anxious for more playoff success. Yes, a conference finals appearance last year was nice. But the way that they lost left a bad taste on the season. Losing in a close-fought, seven-game series to the Bruins would have been a respectable way to go out, but scoring as many goals in the entire series as the Blackhawks did in 17 seconds against the Bruins is a little embarrassing. Thus, the playoffs will define the Penguins’ season this year, and—unless something crazy happens—the regular season will be of little consequence. But hey, there’s another outdoor game this year! Because if there’s one thing that NHL fans want more of, it’s the Penguins playing outdoors. This entry was posted in Pittsburgh Penguins and tagged Chris Kunitz, Evgeni Malkin, Kris Letang, Pascal Dupuis, Rob Scuderi, Saint Sidney, Sidney Crosby, Tomas Vokoun. Bookmark the permalink.